Since I know everyone and their mother will be sharing awesome 4th of July grilling recipes today, I’m going to go a different route and share one of my absolute favorite American classic comfort food casseroles. 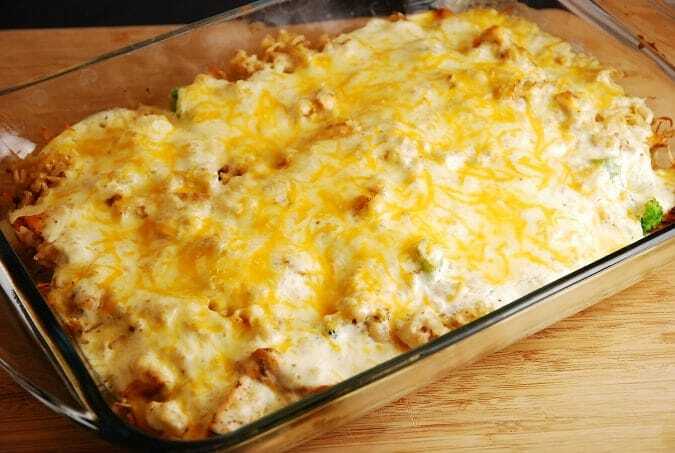 This Cheesy Chicken and Rice Bake has been around forever, but my healthy makeover turns it into an absolutely delicious Weight Watchers Casserole Recipe that gives you a lot of bang for your Points. Each creamy, carb-y and cheesy serving is a lot lighter than most cheesy casserole recipes, so just pair it with a light salad or fresh tomato soup for a complete, and very satisfying, meal. It makes a great family meal that is healthy, flavorful, and still able to help you stay on track to reach your Weight Watchers goals. So if you are just too hot and tired to bust out the grill today, stay in the air conditioning and make this fantastic low calorie Cheesy Chicken and Rice Casserole instead! Keep cool, and enjoy the holiday! American comfort food at its finest, this healthy and delicious Cheesy Chicken and Rice Bake is always a family favorite. It’s a wonderful Weight Watchers casserole recipe that is easy to prepare and very satisfying. This was DELISH! It was a bit high-maintenance in preparation, but the final product was well worth it. My husband said it was the yummiest thing I have EVER cooked, and not just weight watchers meals. Truly felt like I was indulging. It was also a meal you can’t really “snack” on along the way, so you didn’t have many hidden points. I highly recommend it! Made this tonight and it was very good. One thing, I only used 1 cup of broth to cook the rice so not sure where the other cup is used. This recipe was super yummy, and I will definitely make it again It took a bit longer to put together than I expected, and I’m hoping to find a way to decrease the amount of clean up (3 pots + casserole dish). Made this last night and was simply amazing! I used light sour cream, daisy brand, and it didn’t add major points just one. Felt like a fatty bad for me dish and I loved it, thanks. Had this for dinner last night and it was delicious!!! It’s definitely a keeper in my recipe collection :) Thanks so much for sharing!! We don’t use frozen vegetables here — too watery and flavorless–so what are the alternatives? Cooked fresh broccoli of course, but then should I add cooked onions? And what else? Fresh baby spinach? Cooked celery? Or are broccoli and onions enough?